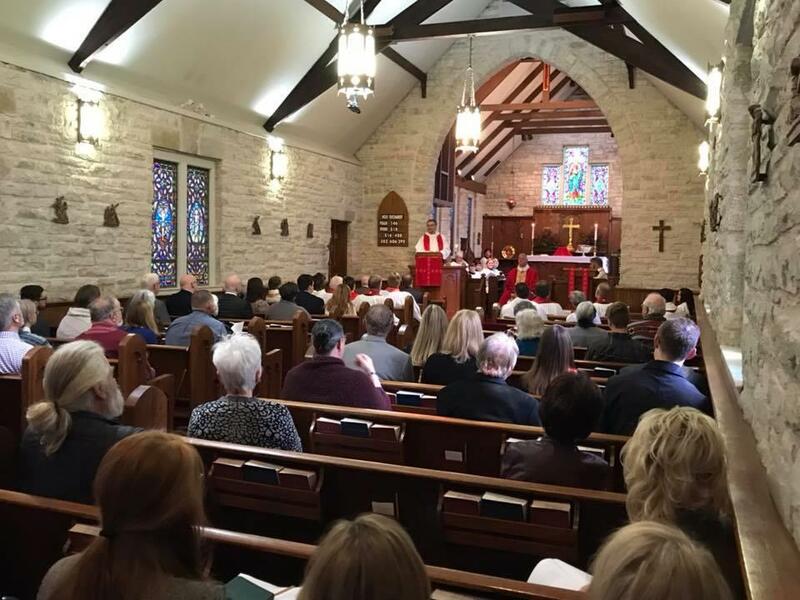 This past Saturday, November 10th, Bishop Edward J. Konieczny celebrated with the people of St. Luke's an energetic and joyful Celebration of New Ministry service held at St. Luke’s Episcopal Church in Ada installing the Rev. Erin Jean Warde as their new Rector. The sounds of the joyous choir filled the church, and the congregation was brimming with those present, despite the cold, to join in this momentous celebration! As the service officially began, Mother Erin was presented by the Wardens of St. Luke’s, Stan Caufield and Carson Taylor, to Bishop Ed and the congregation. Bishop Ed then read aloud the Letter of Institution, which outlines Mother Erin’s new role and responsibilities as Rector of St. Luke’s and as a priest of our diocese. The congregation then joined together for intentional prayers for the Church, the world, and those in need. The Rev. Dr. Chuck Treadwell, Rector of St. David’s Episcopal Church in Austin, Texas, delivered a powerful sermon about Mother Erin’s true servant nature, her many gifts in ministry, and her dedication to those whom she is called to serve. He echoed the importance of ministry for both the role of the Rector and the role of the congregation and encouraged them to enter into this new relationship in ministry with open minds and open hearts, always striving to see the other for who they really are. Following the sermon, Mother Erin was presented with meaningful gifts from several leaders in the congregation and Bishop Ed. These gifts included: a Bible, water, a stole, a Book of Common Prayer, oils, keys, a copy of the Constitution and Canons, and bread and wine. She then knelt in the midst of the congregation and stated her dedication to this calling and to this new step in her ministry through prayer. All present could see the true, heartfelt emotion with which she made this prayer. 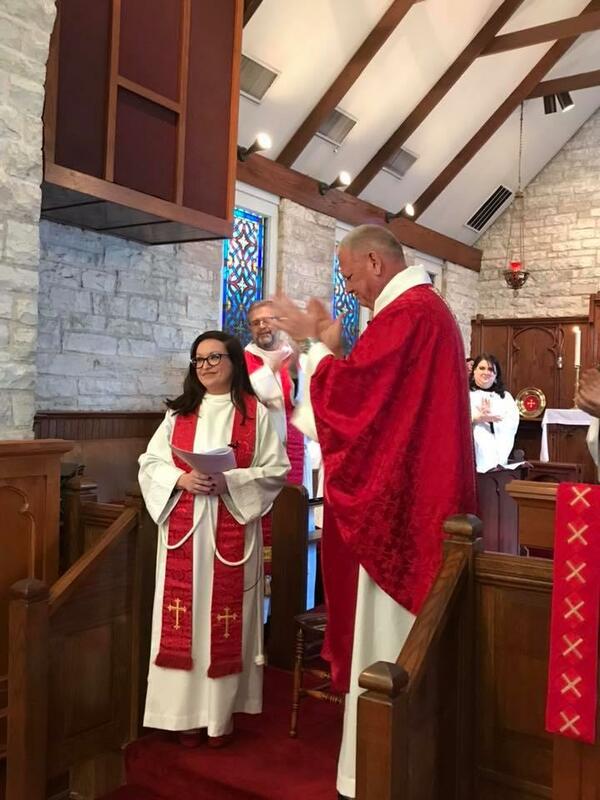 Bishop Ed then officially introduced Mother Erin as the new Rector of St. Luke’s Episcopal Church in Ada, which was met with overwhelmingly joyful applause and celebration! The service then concluded with the Offertory and celebration of Holy Communion. After the service, a celebratory reception was provided by the wonderfully hospitable team of staff and volunteers of St. Luke’s, Ada. Keep an eye out for more photos coming soon!